Occasionally I am lucky enough to find a source for fossils. Gem and Mineral shows, out of the way rock shops, Ebay and other online sites allow me to treasure hunt. The goal is to find good quality specimens small enough to be incorporated into jewelry. Current favorites include Ammonites, Trilobites, and Orthoceras all of which are marine creatures that became extinct millions of years ago. 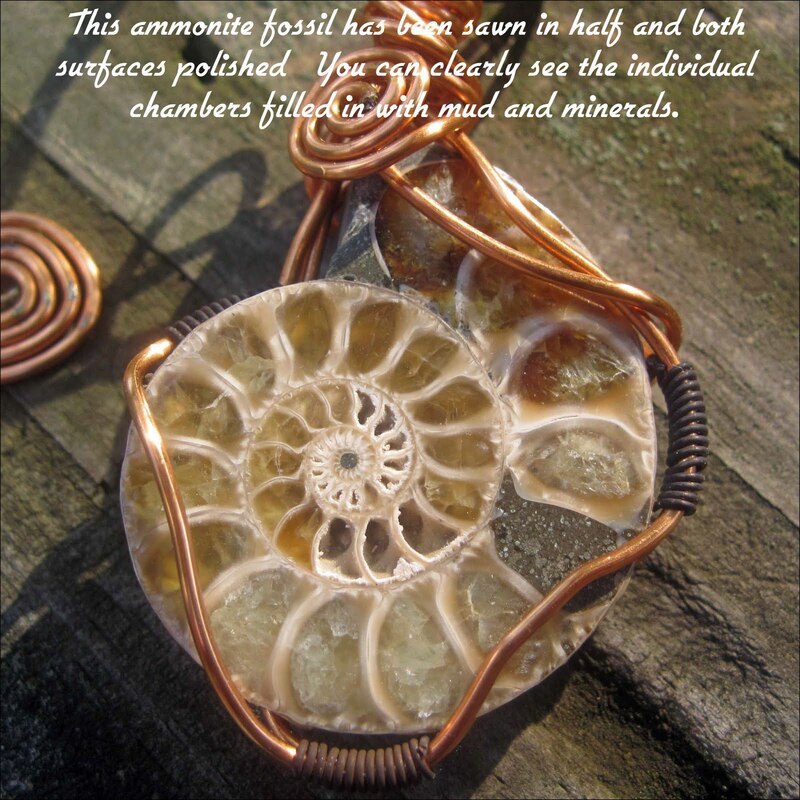 Ammonites are the most commonly available and perhaps the best known after dinosaurs. They were a marine animal whose spiral shell form resembles that of a nautilus. Ammonites were from the Early Jurassic and Late Cretaceous periods so have been extinct for over 60 million years. The spiral form of the shell is separated into chambers. The animal occupied only the outer chamber so as it grew and required more shell space it would seal off the previous chamber behind it. These chambers held gas pockets that kept the shell buoyant. When the animal died the soft fleshy parts decayed and the remaining hard shell filled in with mud and mineral deposits as water passed through it over the millenia. The ammonites that we use have been sawed in half and the surface polished so that you can clearly see these deposits. Ammonites are found on every continent and in every naturally occurring color. Ammonites found in clay will often have the iridescence of their outer shell preserved. In Medieval Europe ammonite fossils were thought to be petrified snakes. They were call serpent stones. Saints Patrick and Hilda were often given credit for their demise. An Ammonite fossil was the original discus used in Greek Olympic games. Navajo and other North American Plains tribes carried ammonites in their medicine bags for health and good hunting. They were called Buffalo stones. 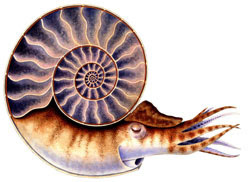 This is an artist illustration of what a live ammonite may have looked like. Great post about the fossils. I love the picture of the nautalis, and your wire wrapping is marvelous. Thank you Linda. I will be writing more this week about other fossil specimens. Tomorrow, Trilbites!